Another innings. Another failure. 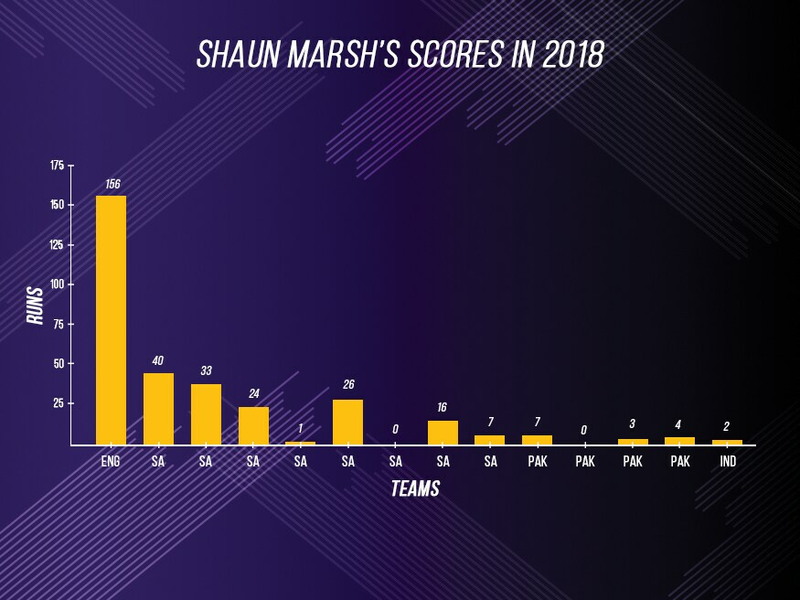 It has become a habit with Shaun Marsh. 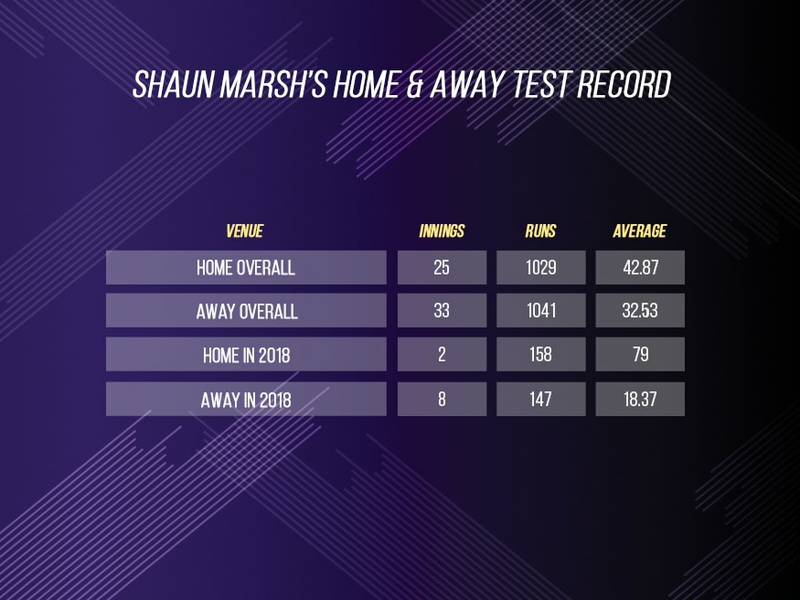 Marsh was persisted with by the Australian selectors despite his failures in South Africa – an average of 18.37 in 8 innings – as though his away record is poor, his home record is pretty decent. And with Smith and Warner unavailable for selection, there were not too many other choices for the selectors. At home, the southpaw averages 42.87 in 25 innings with over a 1000 runs, the numbers in stark contrast to his away record - an average of 32.53 in 33 innings. 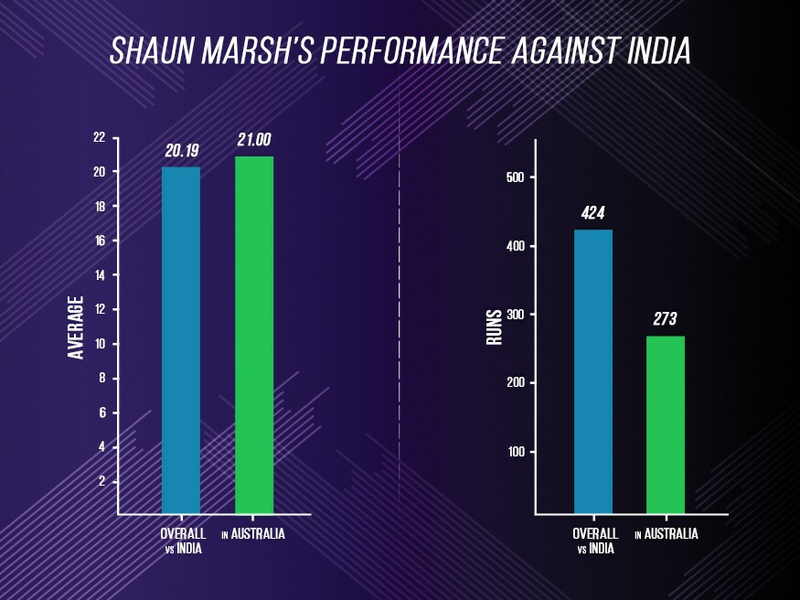 It is perhaps surprising that Australia have played Marsh more away from home than in Australia when there is such a massive difference between his averages. Marsh’s dismissal today was poor – lashing at a wide one from Ashwin and playing on - for an experienced 35-year old batsman with several International caps to his credit, it was an ill-advised shot especially when the team needed him to don the anchor role. But perhaps what eluded the Australian think-tank was Marsh’s terrible record against India. In 13 innings in Australia against India, the southpaw has only managed to make 273 runs at an average of 21. He has seven single-digit scores against them at home – this includes three ducks. He has had problems against both – their pace attack and spinners. The faster bowlers have accounted for his wicket on 9 occasions while Ashwin has dismissed him thrice. His overall average against India stands at 20.19 after 21 innings. With such an incredibly poor record, it was poor judgment include him in the eleven. His last Ashes series at home might have swayed the selectors - Marsh racked up 445 runs at an average of 74.16. But since then it has been down the hill for Marsh. In the remaining games in 2018, Marsh has a combined run tally of 123 in 13 innings. His last few scores read 7, 7, 0, 3, 4 and 2 (today at Adelaide). Marsh has been given a long rope but he may just be running out of luck now.